Thunder Bay Island is listed on the National Register of Historic Places in America, and is located adjacent to the Thunder Bay National Marine Sanctuary and Underwater Preserve. 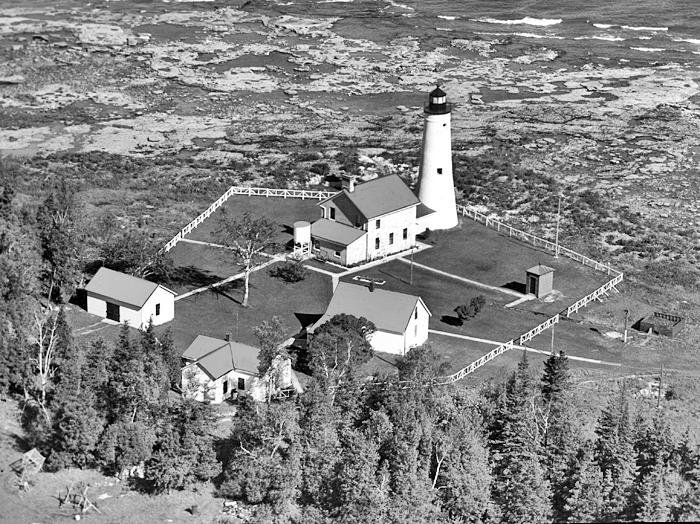 The Thunder Bay Island Lighthouse Preservation Society is an IRS 501(c)(3) nonprofit corporation organized in 1996, and is licensed to solicit by the State of Michigan. We are dedicated to the education, preservation and restoration of Thunder Bay Island and its historic light station The goal of the Thunder Bay Island Lighthouse Preservation Society is the repair, restoration and maintenance of the remaining historic structures on the island. As we do this, we are engaged in gathering documentation of the island and its inhabitants. As we share the information we discover, the public will be able to gain an understanding of, and appreciation for, the valuable maritime history revolving around the island. In December, 1997, the Society and the US Coast Guard signed a ten-year lease for the buildings with an easement to access these buildings. The lease has been extended to 2027, and the society is working in partnership with Alpena Township to gain ownership of the southern portion of the island. Currently, the island is divided between Alpena Township on the southern end, and Bureau of Land Management on the north. Visitors may join society members on trips to the island to conduct work or research deemed to be part of the TBILPS mission. 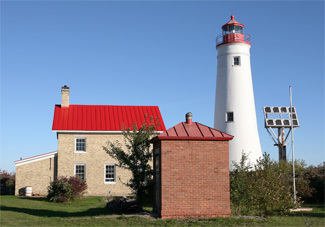 The long-range plan is for the island to be mapped, interpretive signs to be installed, and clearly delineated paths to be created for self-guided tours.The completion of the Historic Structures Report will be a guide for the Preservation Society to follow when restoring or repairing the buildings. Overnight camping and ground fires on the island are prohibited. We are officially posed to begin the Fog Signal building roof rehabilitation project. There will be photos added to our website to keep our visitors updated on the progress. Starting at 12:01 am on Tuesday, November 27, until 11:59 pm, just visit the site address above. Once you're there you will see a large oval button that say"click here to give"--click on it and scroll down until you see Thunder Bay Island Preservation Society then follow the prompts to complete you donation. If you are not a computer user there are 2 options; either go into their office at 100 N. Ripley Blvd, Alpena, or call the office at 989-354-6881 and have your charge card information ready for the volunteer to take your donation. Remember- it only counts for us during that 24 hour period on NOVEMBER 27! This is a taxable deduction on your federal tax return. Thank you to everyone who supports this plea! Click on our Lanterns and Lifeboats button on the main menu to check out our book (Lanterns and Lifeboats) to learn about the history of the Thunder Bay Island Lighthouse. Stay up to date by clicking on the Newsletter button on the main menu. Contact us for more information about the Thunder Bay Island Lighthouse Preservation Society and learn how you can visit Thunder Bay Island. © 2019 Thunder Bay Island Lighthouse Preservation Society. All Rights Reserved. Powered by HostBaby.